The author had a great idea, and it was interesting. The dialogue sucked. I could have tolerated most of it, but the French Girl saying "Ooh La La" every second page irritated me like nothing I have read in forever! If that hadn't been an issue it would have been three or four stars, but damn it was way too annoying. I don't think I would read anything by the author again without a sample chapter. The use of stereo types instead of creating an actual character distracts from the others, who seemed real. As soon as I would absorbed into the plot another "Ool la la" would jar me back to grinding my teeth. When I read the blurb, I was really curious! We’ve all had the internet and the smart-phone revolution HIT us in between the eyes! And we’ve been able to do nothing about it! Crib as we might, we are hooked! We are farther away from each other than ever before! Whatsapping and fiddling with the phone even while we meet other people because we simply run out of things to say when we meet someone!Right, so I’ve ranted against this! But I’ve done nothing. I am forever peering into my phone looking at one update or the other! So I wondered what could the writer have written. I actually confused this with a NON FICTION and thought the author had written ways in which someone can get deaddicted from their phones! And I was wondering what sort of a read that would turn out to be!AND WAS I WRONG!!!! This was such a thriller! I couldn’t have been further off the mark! This book kept me so hooked, I just had to come back and finish it and see what happened next! !The book starts off with these children being carted off to a suspicious facility and then finding it all collapse on top of them! I felt this book was such a revelation into the lives of the rich! I mean when you are living in the lap of luxury, you wouldn’t be expected to develop the skills you would need to survive in the wild. Or what you would do in a village when you didn’t have any luxury. And how would we survive even without say some mobile network or a working data plan? !Our lives across the internet have got so many of us across continents together! But they have pushed everyone close to us, so far away! It is no wonder that we need a TECH DETOX! This book made me think about how lives change when we are put out of our comfort zone.I feel everyone should do something that puts them out of their comfort zone. It breaks the monotony and makes us react in different ways. We also end up exploring ourselves in detail and finding out qualities which we should admire and those we need to work on. There are things which we as a whole (= I mean humanity!) need to place above materialistic concerns like money! That was something that really struck me hard in this book. People who come from a background of money tend to take survival indeed, for granted. Food, clothing, water and shelter were and continue to remain things which people have to fight for! Keeping this in perspective, our constant addiction to this virtual world created by the Internet, feels shallow!I felt really bad at some of the incidents in the book but there were others which made me want to cheer for the children! The highs and lows of this book took me on a ride with them and it was an experience reading the book!I LOVED THE ENDING!! At one point, I almost gave up, thinking that the worst had happened but the book picked me and left me on a different high in the end!! Absolutely loved the book! 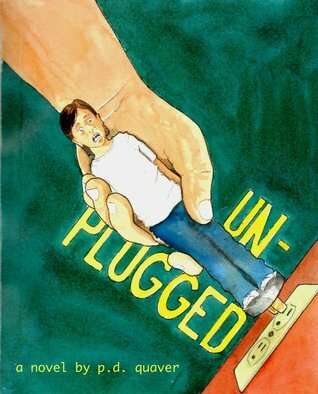 Unplugged is a thrilling tale aimed at young adults. A group of kids are sent to a new summer camp that claims to wean the children off of their dependence and addictions to electronics. But all is not as it appears as it turns out that this summer camp is merely a front for a kidnapping scheme. The kids are whisked away to a remote island and held hostage. Ironically, they DO learn to live and succeed without any electronic benefits. This is reminiscent of a modern day Lord of the Flies - almost, kinda, sorta. The classic book is mentioned in the story and may spark interest in your youngster, if they enjoy this tale, and I'm all for getting today's kids interested in reading classics. As an adult reading this book, it really makes one think. I remember my childhood ... we only had 4 or 5 channels - depending on the weather. Cartoons were limited to Saturday mornings and briefly after school. I can remember a few victorious days where we convinced my great-grandmother to give up her hour of General Hospital so we could watch Woody Woodpecker after school. We politely asked our friend's parents to use the phone if we needed to call home. Our playtime was filled with tag, cops & robbers, jump rope, jacks & marbles, and hide-and-seek. Today's kids seem so dependent on social media, video games, cell phones, and the internet for their entertainment. Girls enjoy Barbie themed video games with no clue what to do with the actual doll. Boys that have mastered Grand Theft Auto may have never played with a Matchbox car. Don't get me wrong - my kids enjoy their electronics as much as the next. However, we also take time out to take the backgammon or chess board up to the park and enjoy the sunshine. After a rousing game, my daughter flies her kite or plays on the playground equipment while I read - albeit on my Kindle most likely, I'm just as guilty of enjoying my electronics as the next person. I think it is important to teach our kids to enjoy the simple things in life, without going nuts and forbidding them entirely. One thing that makes this book a bit scary is the camp. How often do we research camps before sending our kids to them? What do we really know about the summer programs we enroll our children into. The scenario created by author P.D. Quaver really gives parents some food for thought. I know I will be very conscious, and bordering on paranoid, when I make any similar decision regarding my kids in the future. As far as YA fiction goes, this is definitely a book that I will be recommending to my daughter. It teaches that there IS a world out there beyond the internet and that real life can be just as challenging and fun as any video game - it all depends on how you approach it, and it does so without a bunch of cussing or any graphic inappropriate physical activity between the boys and girls. I always give props to authors of young adult fiction. It's not an easy genre. There are so many blurred lines as to what is or is not acceptable. I ventured into the area one time as an author and it was one of the hardest pieces for me to finish, So first, kudos to P.D. Quaver for choosing this area of writing.There is no no doubt that in society as a whole we have become entirely too dependent on our electronic devices. We keep our entire lives stored in our phones. Our contacts, calendars, notes, emails are stored in devices so cheaply made that a fall off the seat of a chair can render them nothing more than a paperweight,In that aspect, "Unplugged" is a bit of a moral tale about our addiction to our electronic devices. It focuses today's youth who seem to be conjoined with their devices. We meet many types of addicted young people. One's vice is video games, the other is hacking, and yet another a 13 year old so brilliant she is getting paid to write papers for college students through an online service.The guise of "The Natural Path" is an island camp for teenagers who are addicted to technology and need to unplug and get in touch with the world around them. It seems like a great idea. All electronic gadgets are left at the door and the kids learn about things like wildlife and how to properly socialize.Except...The camp is just a ruse to isolate the children of wealthy parents and kidnap them and hold them for a high ransom. The kids are left to using their own wits and each other's support to escape their captors. The children are forced to interact with real people, to figure things out without the aid of Google, and to learn that true friendships and loyalties can not be made electronically.If you are a fan on the 1986 film, Fortress, this book will be right up your alley. It is very well written, the characters are unique and not cookie cutter kids, and the villains are quite good at being villainous. I had a great time reading 'Unplugged" and so will you. As a parent, I found this premise intriguing--kids forced to give up their electronic devices and survive. Yes, this would be a battle even for most adults. But this story isn't really about whether or not the kids can handle life without technology as much as it's a thriller about kids literally fighting for their lives.The story starts with a group of teens being dropped off for a special summer camp, which doesn't allow any electronic devices in hopes of bringing the youth closer to nature. They are all rich, except for the MC, Max, whose father lied to get him there. The author does a fantastic job in bringing across characters with a wide variety of personalities. Each one is believable and well done. He also does an amazing job giving each their own voice. Even in the dialogue itself, it's easy to recognize the characters through their speech patterns. The kids are for the most part authentic and likable. It's easy to sympathize with them and fever for them as they fight their way through the adventure. It's fun to watch their ingenuity and how they pull together despite the differences. Each one brings their own strengths, none which is less valuable than another. It was nice to see this.The plot is fast paced. The story itself well written. The reader falls into the world and does not want to come out. Although recommended for kids 13 and up, I found the writing more fitting for reluctant readers in this age group or middle graders (older) (the reason it's getting 4 stars instead of 5). But unfortunately, the violence is too vivid to recommend this to the second of these reading groups. However, reluctant YA readers will love the fast paced action and devour the book to the very end.I received a free copy for an honest review. I enjoyed this book. It was engaging and held my attention. I found myself thinking about it when I wasn't expecting to.